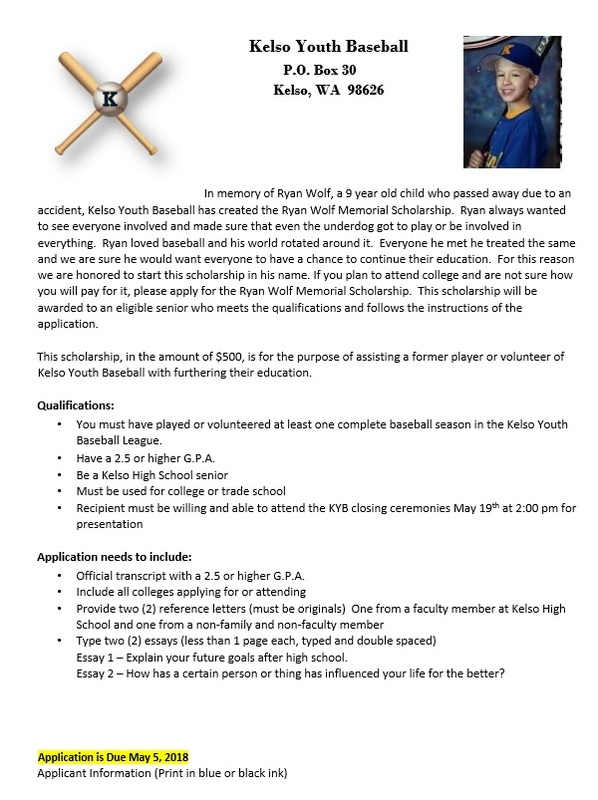 In memory of Ryan Wolf, a 9 year old child who passed away due to an accident, Kelso Youth Baseball has created the Ryan Wolf Memorial Scholarship. Ryan always wanted to see everyone involved and made sure that even the underdog got to play or be involved in everything. Ryan loved baseball and his world rotated around it. Everyone he met he treated the same and we are sure he would want everyone to have a chance to continue their education. For this reason we are honored to start this scholarship in his name. If you plan to attend college and are not sure how you will pay for it, please apply for the Ryan Wolf Memorial Scholarship. This scholarship will be awarded to an eligible senior who meets the qualifications and follows the instructions of the application. This scholarship, in the amount of $500, is for the purpose of assisting a former player or volunteer of Kelso Youth Baseball with furthering their education. You must have played or volunteered at least one complete baseball season in the Kelso Youth Baseball League. Have a 2.5 or higher G.P.A. Official transcript with a 2.5 or higher G.P.A. Essay 1 – Explain your future goals after high school. Essay 2 – How has a certain person or thing has influenced your life for the better? See attachment for application form! Proof of college enrollment must be provided by July 15, 2018 before money will be issued, unless otherwise arranged with KYB. 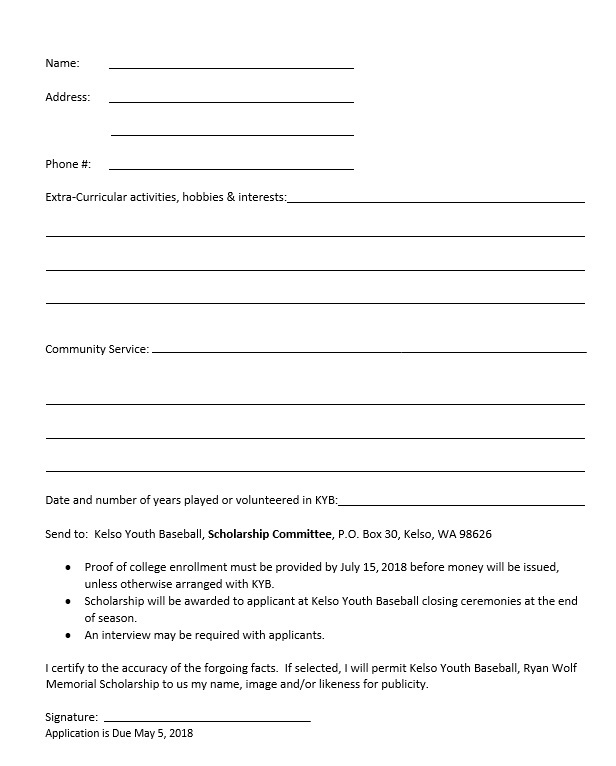 Scholarship will be awarded to applicant at Kelso Youth Baseball closing ceremonies at the end of season. 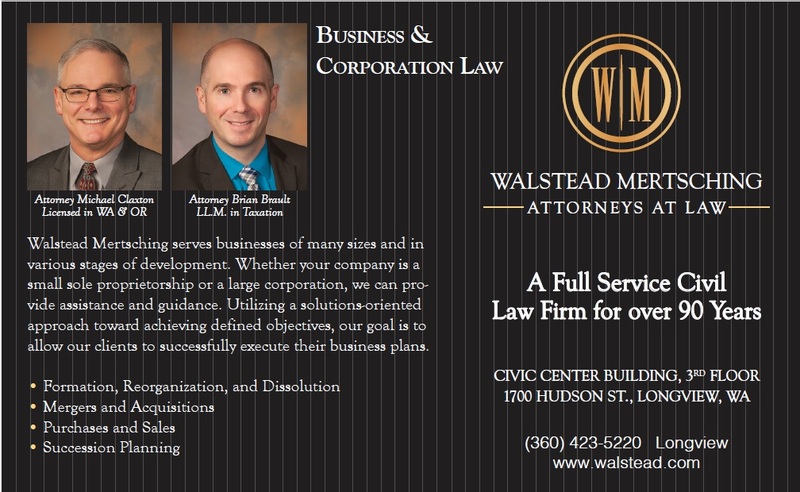 An interview may be required with applicants.